Over my years online and also advising people on their computer setups, I have seen some very concerning things. People writing down their passwords in books, on little slips of paper in their purses and wallets or even in their notepad on their computer. Using a strong password will make your online accounts a lot tougher for strangers to hack. It is essential you protect your online accounts, things like email, social media and online banking for example. Never fall into the trap of using the same password for everything either. Check out the tips below to get on the right path. 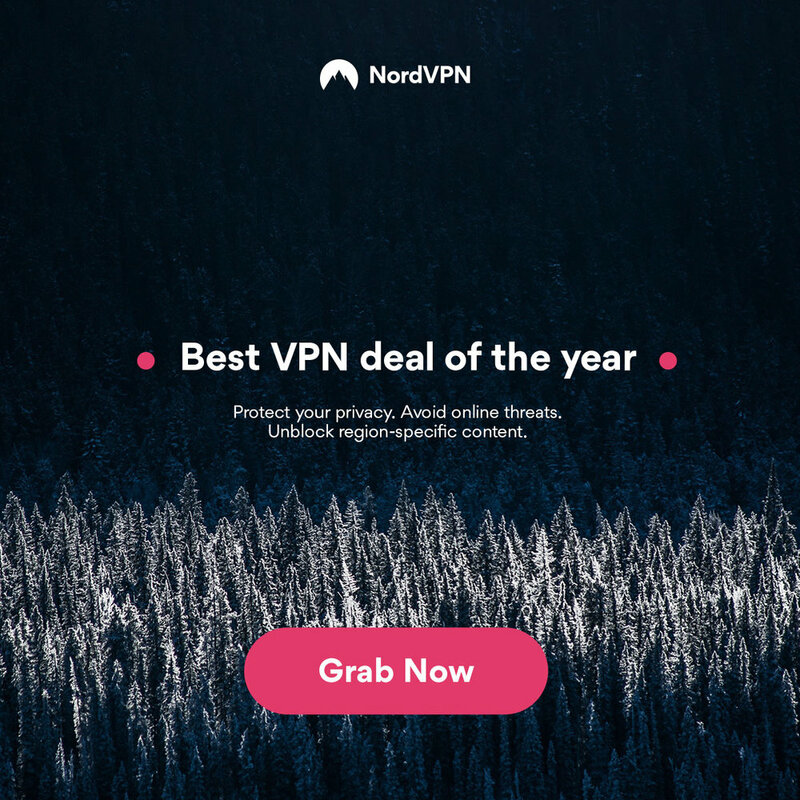 If you want some added protection when browsing online, consider using a VPN such as NordVPN. *Links are affiliate links and earn Geekanoids a small commission, they don’t cost you any extra. Olympus today introduces their new OM-D E-M1X camera: designed to meet professional photographers needs for reliability, speed, precision and image quality. The E-M1X remains true to Olympus’ promise to design the most compact and lightweight camera system in its class whilst packed with the latest imaging technologies in a robust casing with integrated vertical grip. Featuring the world’s best image stabilization (IS) performance1, a re-developed and fast autofocus (AF) system, as well as two TruePic VIII image processors allowing for high-speed responsiveness and handheld High Res Shots; this powerhouse camera offers a compelling mix of impressive featuresand portability. Two years after laying down a marker in the professional camera category with the OM-D E-M1 Mark II, new M.Zuiko PRO lenses and the launch of the Olympus PRO service, the new E-M1X will now be added to Olympus’ offering for professional users. With its integrated vertical grip, the world’s best dust-, splash- and freezeproof body2 and numerous new features demanded by professional photographers, the E-M1X offers unprecedented control, ergonomics and stabilitywhile delivering professional results under all weather conditions. With a new gyro sensor, Olympus has taken their acclaimed 5-axis sync IS to a new level offering up to 7.5 shutter speed steps of compensation1. The OM-D AF system has been completely redeveloped, offering additional focal points and a new intelligent subject detection function to automatically track certain subjects. The high-speed shooting capabilities have been enhanced and anti-flicker shooting has been added. Further improvements include a handheld High Res Shot, a live ND filter functionality as well as a customizable menu, USB powering & charging capabilitiesand two UHS II SD card slots. In combination with high-quality M.Zuiko lenses, a new wireless flash and the image management software “Olympus Workspace”, the E-M1X is the perfect tool to capture professional results. The camera’s Pro Capture Mode records up to 35 frames retroactively from when the shutter button is released during shooting. This feature already received praisewhen being introduced on the OM-D E-M1 Mark II, and is ideal for action photography. With the ultra-high Cinema 4K (C4K, 4096 x 2160) movie format, videographers not only have the highest recording resolution to date, but also more flexibility when it comes to postproduction. The powerful 5-axis IS and electronic stabilization enable refined handheld 4K and C4K video recording with three selectable levels of movement compensationdepending on the photographer’s posture and movement. To counteract changing lighting conditions typical during documentary and nature shooting, the E-M1X supports log shooting. OM-Log400 delivers movies without loss of details in shadows or highlight blowouts, and greater freedom over video creativity through color grading. 120 fps high-speed movies are also now supported in Full HD resulting in the capability to shoot cinematic movies with slow-motion perception. With an anti-flicker shooting feature, the camera detects the flicker frequency of artificial light sources and activates the shutter at peak brightness to minimizeuneven exposures and coloring between sequential frames. Flicker scan suppresses striped patterns that can occur when using Silent Mode (electronic shutter) and when shooting movies, so that users can fine tune the shutter speed. The OM-D E-M1X is compatible with Olympus’ range of professional-grade Micro Four Thirds lenses and accessories, including tailor-made camera bags, electronic flashes and flash accessories (see below). Today sees TalkTalk launch a Fairer Broadband Charter to challenge unfair industry practices as new research unveils the true extent of consumer frustration within the telecoms industry. The research commissioned by TalkTalk as part of its campaign for fairer broadband found that almost nine out of ten (87%) consumers think it’s unfair that providers raise their broadband price mid-contract. All major providers except TalkTalk have introduced a mid-contract broadband price increase in the last 18 months, so it’s no surprise that 54% of consumers would support a complete ban on these price hikes. The research also found that loyal customers continue to be punished as broadband providers fail to let customers know when their contract is coming to an end. Almost two out of three (62%) say they don’t know when their contract ends, as they’re left to roll onto higher out-of-contract rates. Since launching its range of Fixed Price Plans two years ago, which guarantee no mid-contract broadband price increases, TalkTalk’s Fairness Charter is the latest demonstration of its commitment to fairness and value. The three-point charter challenges the telecoms industry to end mid-contract broadband price hikes by promising that the price customers sign up to will be the same for the duration of their contract. Following Ofcom’s latest initiative to ensure customers are notified when their contract is coming to an end, TalkTalk’s Fairer Broadband charter puts the value provider ahead of the pack with its pledge to continue contacting all customers before they come out-of-contract. 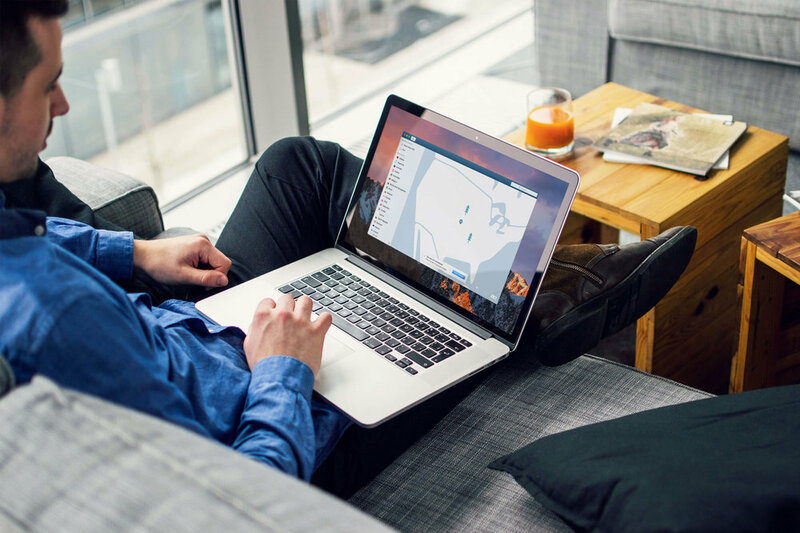 TalkTalk is taking this a step further by proactively offering competitive package prices so customers can continue benefiting from value for money broadband that suits their needs. The charter also encourages competitors to follow TalkTalk’s lead in offering a connection guarantee – allowing customers to walk away if their connectivity falls short of what they were promised. It’s time to end unfair mid-contract price rises. We are challenging all providers to guarantee that the price customers sign up to will be the price they pay. Customers can feel cheated when providers increase prices mid-way through a contract. TalkTalk is the only major broadband provider to guarantee no mid-contract broadband price rises across all its plans. It’s an issue of trust. If customers sign a contract, they expect it to be honoured. We are challenging all providers to introduce a connection guarantee – allowing all new fibre customers to walk away if the speed and reliability of services falls short of what they were promised. Customers need to have confidence than they’ll get what they were promised. That’s why we’ve introduced a Great Connection Guarantee, meaning new fibre customers are free to leave at any point for the first 30 days of going live if they’re unhappy with the connection. Our standard broadband customers who upgrade to fibre can also make the most of this initiative. If they are unhappy with their upgrade, they can rollback to standard broadband without penalty in the first 30 days of going live. We are now looking at extending this initiative to new standard broadband customers. We are challenging all providers to proactively write to customers before their contract expires, warning them about any price rises and offering the option to re-contract at lower prices than standard out-of-contract pricing. That gives power back to customers and avoids hidden price increases. For too long, providers have avoided warning customers when their contract is about to expire. That leaves too many customers paying more than they realise. Some customers may prefer the flexibility of being out of contract, but providers should warn them and allow customers to make an informed choice, rather than hoping they don’t realise their bills have gone up. We already contact customers to let them know their price will change when their contract ends, but to ensure they take advantage of our best value deals we’re taking this a step further. contact all customers before they come out of contract, offering competitive packages so they can continue benefiting from fixed, value for money broadband that suits their needs. always aim to offer the best available deals and clearly state in the communications that other promotions may be available at any given time. contact all customers, including those out-of-contract, on an annual basis with a ‘value update’. This will allow them to review their products and services helping to ensure they get the best deal for them. Some of Sky Sports' most well-known faces took to the race course this week as they put some of TV's most exciting gadgets to the test in a race. Soccer AM's Tubes, Nasser Hussain, Carl Froch, Will Greenwood and Natalie Pinkham were the stars battling for glory as they marshalled one piece of technology each around the track. Tubes was put in charge of BATCAM Drive, a 35mph small kart, while Nasser Hussain took charge of the The BATCAM drone, which is used in the Premier League, and is capable of flying at 40mph. Carl Froch tried to find his way round the track on a Steadiseg – a modified Segway - with a Steadicam, while Natalie Pinkham drove the Sky Cart and Will Greenwood sprinted on foot, wearing a Ref Cam and Umpire Cam. But the real question is… who came out on top? Watch the video to find out. Mental Health Awareness is very important and having personally experienced this, I know talking about the subject is a great healer. There is also a wealth of knowledge and help available and I want to make this more accessible to everyone. My long term goal is to set up a foundation that can be accessed by Mental Health sufferers worldwide. This got me thinking of ways to raise funds to make this happen, to make a real difference. The solution could be using the 'power of the internet & social media'. If everyone donated just £1 that would equate to billions, Sounds crazy right ! Can I donate more than £1 ? well, yes, any larger amount will be gracefully accepted. The reason £1 was originally suggested, is that it's a smaller, more manageable sum of money that most would have less issue giving. £1 means giving up … a cup of coffee, your daily newspaper for a few days, a bar of chocolate or something as small as a glass of wine. So, what will the money be used for? It is my intention to put together an event that would bring together many professionals in this sector, together with those that have experienced Mental Health Issues. This will raise further awareness and also give us the information we need to make help and advice more accessible. Long term plans include establishing a foundation that can be accessed by Mental Health sufferers worldwide. I will be updating the graphic below with progress every week, so keep checking back on this post. For this to work we need to get this article shared on as many Twitter accounts and Facebook pages as possible, plus any other social media you use. 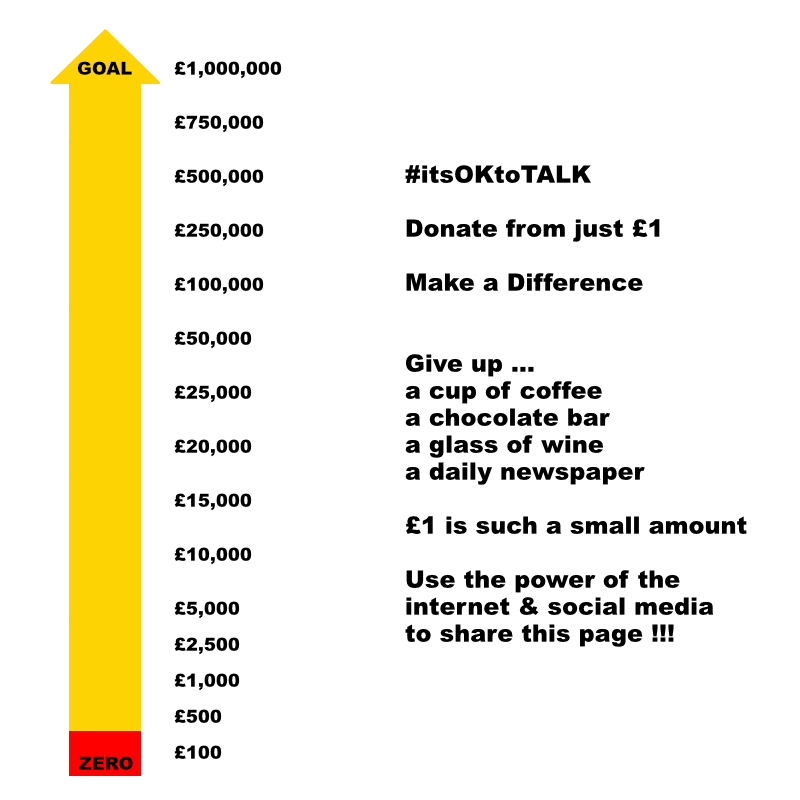 Simply share a link to this article, mention you donated and use the hashtag #itsOKtoTALK … or simply copy & paste the message below. Please note; all donations are non refundable. If the goal is not met, no refunds will be made. If the goal is not met, the funds used will be used to move the project forwards in an alternative way to ensure they are used to good effect. No correspondence will be entered into regarding this fundraiser and emails cannot be replied to.